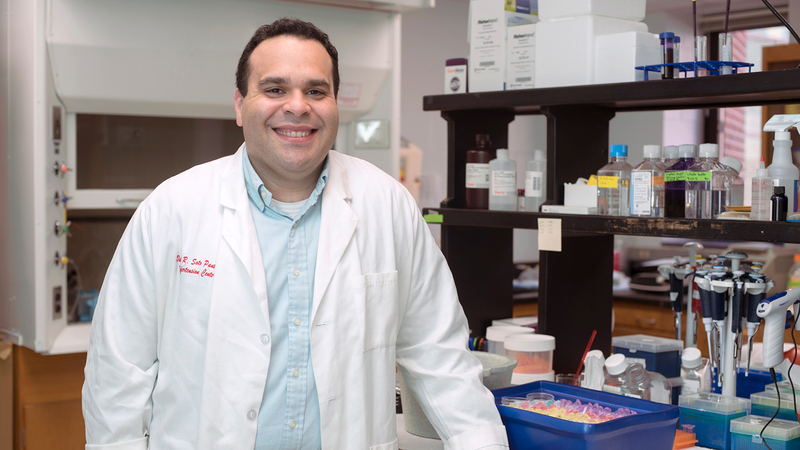 David Soto-Pantoja, PhD, investigates cell surface receptor CD47 as an immunotherapy for breast, lung, head and neck cancers and melanoma. Through clinical trials and animal model collaborations, he explores the effects of CD47 targeting on tumor cell bioenergetics, with the goal of developing anti-cancer therapeutics that inhibit tumor growth and prevent chemotherapy-related cardiac toxicity. Soto-Pantoja earned a doctorate in molecular genetics and genomics from Wake Forest School of Medicine. During his doctoral studies, he researched the role of Angiotensin-(1-7), a small peptide molecule, in the targeted treatment of triple-negative breast cancer through one of the first in-house clinical trials at Wake Forest Baptist Medical Center’s Comprehensive Cancer Center. He worked as a cancer research training award fellow at the National Cancer Institute for six years, studying therapeutic strategies to improve antitumor immunity through CD47. In 2015, Soto-Pantoja joined the departments of surgery, radiation oncology and cancer biology at Wake Forest School of Medicine to further examine CD47 as an anti-cancer therapeutic. While Soto-Pantoja’s early career work focused on inhibiting breast cancer tumor growth through Angiotensin-(1-7), recent efforts focus on the role of CD47 signaling in the tumor microenvironment for several cancers including breast, lung, head and neck cancers, and melanoma. His lab was the first to show that CD47 regulates T-cell function and has significant capability as an immune checkpoint inhibitor. Through preclinical and clinical studies, he investigates the impact of CD47 deficiency on immunometabolism and autophagy, cancer metastasis, cell bioenergetics and chemotherapy resistance. In addition to immunotherapy, Soto-Pantoja studies CD47 as a defense countermeasure drug, examining its protective effects against ionizing radiation exposure and the impact of receptor blockage on chemotherapy-related cardiac toxicities associated with anthracycline therapy for breast cancer. His interest extends to studying the cardiovascular protective effects of CD47 targeting on other immunotherapies (outside of anthracylcines) causing cardiovascular complications. Through industry collaboration, Soto-Pantoja develops small molecule morpholino antisense drugs targeting CD47. He also has extensive experience developing mouse models for testing anti-cancer compounds and analyzing the impact of CD47 signaling and other immune checkpoints on cell function and immune response.